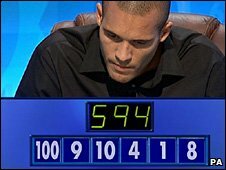 Premier League footballer Clarke Carlisle said he was "delighted" and "relieved" to beat his opponent during his first appearance on Countdown. The Burnley player saw off reigning champion Adam Guest 89-55, even guessing the nine letter word - called the conundrum - at the end. He told host Jeff Stelling: "I can't say it's better than winning a big football game - but it's up there." He said he has always wanted to appear on the Channel 4 word and numbers show. "It's a lifelong ambition. I'm just delighted to be here," he said. Carlisle had previously failed an audition for the show during a long-term injury several years ago. But now the athlete is set to return on Thursday's episode after winning his first game. In 2002, he was crowned Britain's Brainiest Footballer in an ITV show hosted by former Countdown co-host Carol Vorderman.